This 3-in-1 baby/toddler safety harness from Yochi Yochi is a life saver. As a parent of four children this product is one that you will use all the time! It’s compact so you can slide it into your diaper bag and it won’t take up much space. It’s super convenient and you can use it in multiple ways. First it’s a portable high chair. You can put your child in the harness using the leg holes and then secure it to the back of any chair. It’s adjustable to it works with any chair or seat. You have a high chair in minutes. I love this product because I can have a high chair no matter where I am and I won’t have to use those dirty high chairs at public places. Second it is a walking harness. You can fold up the leg holes under the strap and wrap it around your child. Use the handle on the straps to keep your child close by when you are out in public places. Since it goes around their waste you don’t have to worry about it hurting your child if they run ahead or jerk on the harness. This can be a real life saver when you are in really crowded places. Finally it’s a cart safety strap. You can wrap the strap around the child and then secure the strap to the cart. That way if they stand up (which mine always did) if they fall over or get bumped then you don’t have to worry about them fall out of the cart. They will be nice and secure in the cart. I’ve heard so many horror stories about children being injured in shopping carts so this really gives me some peace of mind. It’s a great high quality harness made of durable high quality products. You can feel safe using this product. Small apartment, or travelling? This is an excellent space saver high chair because it fits on most chairs – use as portable high chair for babies/ toddler chair at home, or use in restaurants or at grandma’s house. Super easy to use and clean up. It’s light and you can easily wipe away light spills or wash in your washing machine for tougher stains. It’s the perfect travel harness because if you’re traveling with kids, who has space for big, bulky travel chairs. Traveling abroad? High chairs and shopping cart safety straps are not standard features globally so take your own travel high chair. Walking through crowded airports? You’re going to need a safety harness to keep your kid(s) close. Or, if you’re flying and you didn’t pay for a seat, strap your toddler to you. It’s a great all rounder and a must have if you are travelling with kids. 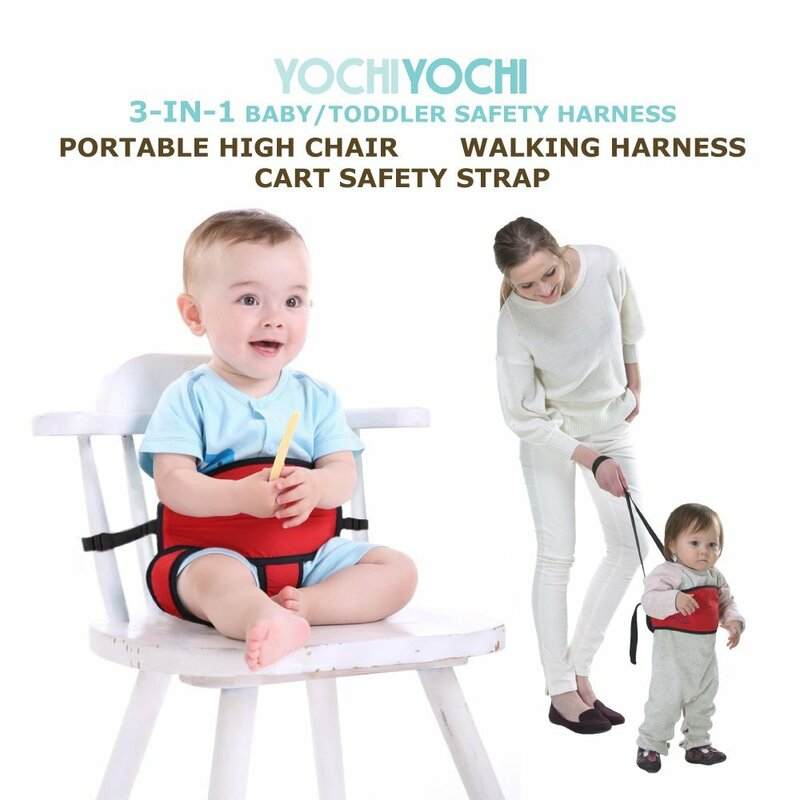 Yochi Yochi is versatile because you can use it as a portable high chair/ travel high chair, or grocery cart safety strap, or it’s extremely useful to use as a toddler harness for when you are at theme parks and you want to give your kid the freedom to walk around, but stay safe and within reach. Plus it grows with your child because you can use it from the time they are 6 months, all the way to 5 years. Use as a baby harness or toddler harness when you are out and about. Small enough to fit into a purse or dad’s pocket, so you can easily turn your baby into a portable baby. Great to use all year round because the fabric is breathable, so no worries about heat rashes. We are pleased to offer a money back guarantee – see product description below for more information. You can purchase this harness on Amazon!